As we discussed here, oil at these prices does not make for a good long-term investment, contrary to what alarmists will tell you. High oil prices cause a decrease in oil demand, and therefore a drop in the oil price, over time. Yes, demand is fairly sticky in the short-run, as it takes time for energy efficiencies to be implemented and for changes to occur in the make-up of the economy's fixed assets (e.g. a phasing out of SUVs in favour of smaller vehicles). On a long-term chart the drop in consumption may not look like much. However, as mentioned this is a gradual process and will continue to take place going forward. 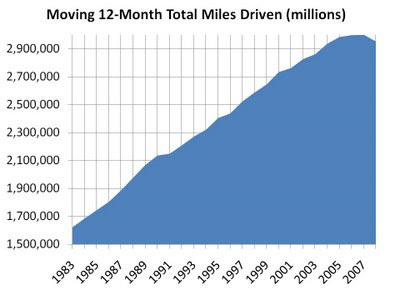 Further, this chart only measures miles driven, not the efficiency of those miles, which is also improving. And finally, these are 12-month totals, which don't fully capture recent drops in consumption which have been relatively larger than those of several months ago. For example, you have to go back to 2002 to find June numbers lower than those of 2008, suggesting 12-month rolling totals will continue to fall. The bottom-line is, as demand falls and supplies catch up, the long-term oil price will fall, not rise as many expect it to.